Card base (finished) measures 5 1/2″ X 4 1/4″. It is cut out of stamping up card stock in Pretty in Pink. The embossed section measures 5 1/4″ X 4″ it is very vanilla card stock and is embossed using the new cuttlebug folder stencils. I embellished the backgroud with chalk and then used a spray fixative. The “Thanks so much” is from the sincere salutations set. This set is still available from stampin up. 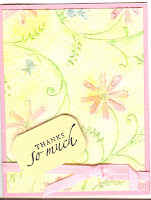 The “Thanks so much” is raised with a pop dot and the card is finished off with ribbon and glitter. I really like the way this card finished off. I made eleven of them. Ten are for folks who supported my mother and my family during the loss of my sister. Of course, I sent one off for possible publication in “Just Cards”. By the way I have two cards in the Dec/Jan (Winter) issue of Just Cards. I’m thrilled. This card will be a valentine swap card. I also used a cuttlebug embossing folder, it is embellished with glitter and the sentiment is by katie & Co. I used a marker to colro just the ‘I love you’ part and it was stamped onto a piece of whisper white cards stock punched out of the scallop punch (Stampin Up). Please do not hesitate to check out my other blogs and my picture trail sight. As always I am available to teach private and group classes (Reasonable rates, all supplies included). Just contact me via email or phone. Email is ms.rhetta@verizon.net and phone is 301-490-1719. I look forward to speaking with you! Have a Stamp Happy Weekend!